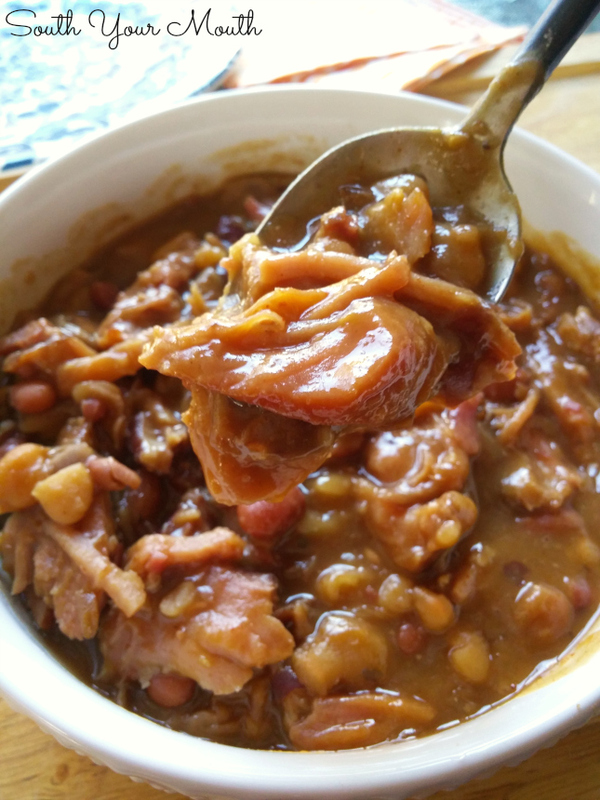 Smokey, creamy beans cooked low and slow with a ham bone and Cajun seasonings. DELICIOUS over rice! The development of this recipe was sponsored by Hurst's Beans. As always, all opinions are my own. Like many of you, I grew up eating ham and beans. And we loved it! I always looked forward to Christmas and Easter because I knew we’d have a ham which meant soon thereafter we’d be having beans! Then one year Daddy came home from the grocery store with these beans. We’d always just used dried butter beans so we were a little taken aback at Daddy stepping outside the box and coming home with a 15-bean mix, much less a Cajun variety! I don’t know how y’all are at your house, but the way I grew up, you just don’t go screwing around with tried-and-true recipes like ham and beans! I wanted my butter beans. So Daddy cooked them (the same way we usually do, not by the recipe on the back of the bag) and we fell in love. Like, really fell in love. And to this day, we don’t use anything else! I wanted to make these for y’all before Christmas so you could have the recipe to use with your leftover ham but I didn’t want to cook a whole ham just to get to the bone so I called Mama to see if she had a ham bone in the freezer. She told me she didn’t but that I could get one at Honey Baked Ham. I didn’t even know you could do that! For seven bucks they gave me a bone with a TON of meat on it. I just rinsed it under hot water to get all that sugar off and plopped it in a pot with my beans and some water and a few hours later I had this GLORIOUS pot of beans! 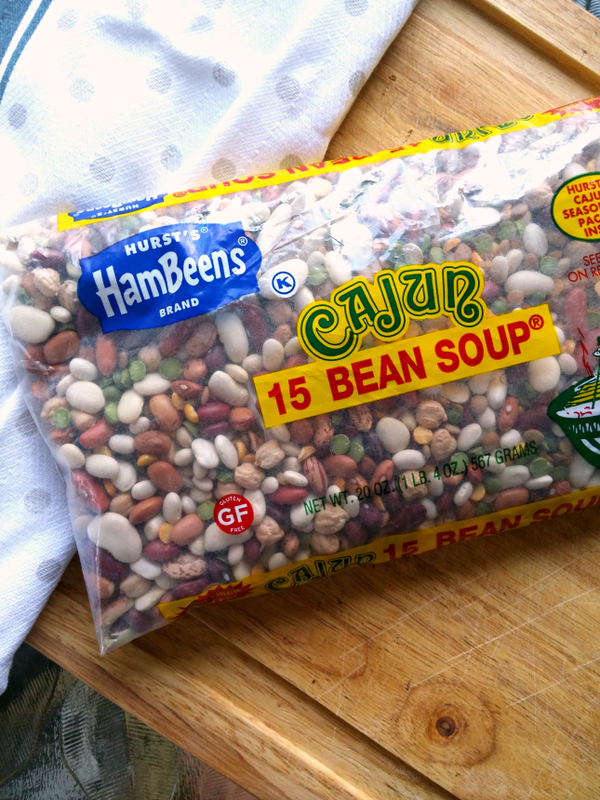 If you can’t find Hurst’s Cajun 15 Bean Soup in your local grocery store, ask for it! My grocery store now carries all sorts of products they didn’t have before simply because I asked for them. Just ask the cashier who to talk to to request a product and s/he will point you in the right direction. My store has a list at the Customer Service desk where they notate products their customers' request. If you love hearty bean recipes like this, check out a few of these dishes too! Slow Cooker Pinto Beans - Dried pintos beans cook up creamy and tender with a smoky, silky sauce that's perfect with cornbread. 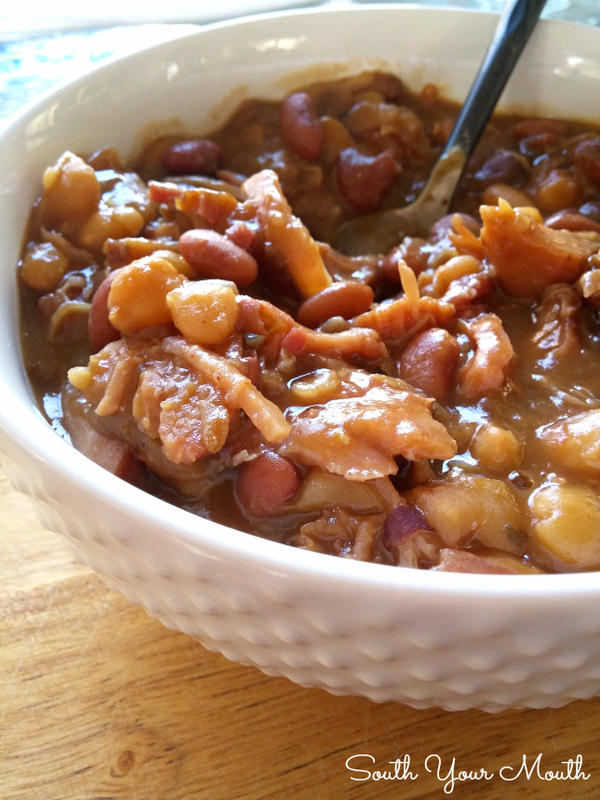 Three Meat Crock Pot Cowboy Beans- This slow Cooker BBQ bean recipe with smoked sausage, bacon and ground beef is the perfect side dish for feeding a crowd! BIG BATCH Beef & Bean Chili - This incredibly delicious, easy beef and bean chili recipe serves 18-20 people and is perfect for feeding a crowd! Shrimp & Sausage 15 Bean Gumbo - A rich gumbo recipe with Cajun beans chocked full of spicy shrimp and smoky sausage. Pineapple & Bacon Baked Beans - A baked beans recipe with a Hawaiian twist made with sweet pineapple and smoky bacon or ham! 15 Bean Turkey Soup - A hearty soup recipe perfect for leftover Thanksgiving turkey and also easy to make with smoked turkey wings or legs. This recipe was shared at the Weekend Potluck! Combine beans (with included seasoning packet), water, garlic powder and ham bone in a large pot or Dutch oven. Heat over medium-high heat until simmering. Once simmering, cover pot then reduce heat to low and simmer for 4 hours. Remove ham bone and allow to cool a bit (so you can handle it without burning your fingerprints off). Using a knife, fork or your fingers, pull all the meat off the bone then add it back to the beans. If using additional chopped ham, add it to the pot as well. Continue cooking beans for 2-3 more hours or until beans are tender. Add salt to taste if necessary. Enjoy this as a soup or serve over white rice. This can finish a little on the salty side depending on how much ham you use which is why we always serve it over plain white rice. If your ham bone doesn’t have a lot of meat on it, you may need to add a little salt but don’t add it until the end because the beans will draw salt from the ham bone as they cook together. If you’d like to serve this as a soup (and not over rice), use 8 cups of water. You can add more to reach your desired consistency but I’d start with 8 cups and see how it goes. Yes, you can cook this in a crock pot! Cook the same way replacing the first 4 hours on the stove with 5-6 hours on high in the crock pot. Keep up with my latest shenanigans by following South Your Mouth! Hi, I just read this recipe and I think my husband will love it. My question is this: normally these type of bean packages require the traditional overnight soaking (or the quick soak method) before cooking. Is this true of your recipe or do you cook without soaking? Thanks! No need to soak these :) The beans will cook nice and tender. I hope your husband enjoys! What a coincidence. I saw these exact same beans in the grocery last week. I bought them not knowing what I was going to do with them. I'm a terrible shopper! This morning I found this recipe in my email. It's on the menu for tomorrow! Whoa.... that's like bean destiny! Too weird! I buy wonky stuff all the time not knowing what I'm going to do with it. I've discovered some of my favorite dishes that way ;) I hope you enjoy! Holy Yumminess! I hope I can find these beans! I am on a mission. I have to make this!!!! Found a package of Hurst's Bacon And Beans yesterday! Can't wait to try. I always use the Ham and Beans. I also add potatoes and carrots to mine to stretch! This was my sons favorite soup when he was little (he's almost 30!). I diced up onion, celery, garlic, tossed it in the crock pot with the beans, a can of diced tomatoes, the flavoring pack, some diced andouille, and vegetable stock and let it cook on low all day while I was at work. We still eat it today. I love your site, so many yummy ideas! I stood in the store with the regular beans and Cajun beans in my hand . I couldn't remember what your recipe called for, but I saw that the Cajun package indicated that they were hot, so I was a little concerned and went with the regular and I'll add Cajun seasoning. For future reference, do you find the Cajun to be too spicy? Thanks for this recipe they'll be perfect for a cold front coming through with a pot of cornbread! I have a bag of similar 15 bean mix but without the seasoning packet. How much Cajun seasoning would you add to this recipe? Thank you! Love your website! 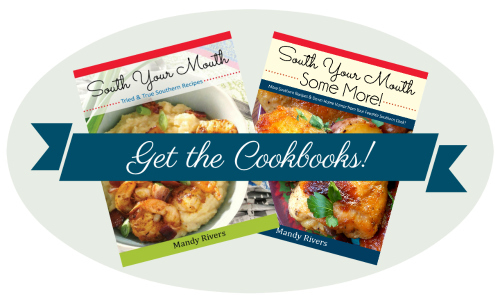 I love that I found a Blog filled with some good old southern Food! I lived in Tennessee for a while and miss the food! I just started a blog of my own and I wanted to know if you had any good tips for someone starting out? Thanks! I'm so glad you enjoyed it! hello, I'm making this recipe right now. Slow cooker, so far about 2 hours. My plan is to have it on high for 6, take the ham of the bone and then 2 more, also on high. In order to look like yours, will I need to add some cornstarch towards the end? Thanks and looking forward to try it tonight. Hey! It will all thicken up nicely on its own. If it's not as thick as you'd like, finish it with the lid off the last 2 hours but I'm sure it will be fine! LOL it'll be great either way! Enjoy! Do you have a suggestion on how to store this recipe? I assume the beans can’t be frozen, but maybe canned? I have a couple of ham bones from Easter so one will be soup but the other I would love to use for this recipe for a grill night at a later date! But maybe I just need to freeze the ham bone to make this later? I just cooked this recipe with a ham bone and chopped onion in my Instant Pot 8 quart Ultra last week and it was "delicious"! I cooked it with pressure for 1 hour and 15 minutes with the Natural Release and added cut up bits of left over Honey Baked ham after I opened the pot when the beans were done and the pressure was down. The beans were hot enough to heat the bits of ham. Since there are just 2 of us I have leftovers to freeze for other meals. Thanks for sharing this recipe for everyone. Get New Recipes by Email!